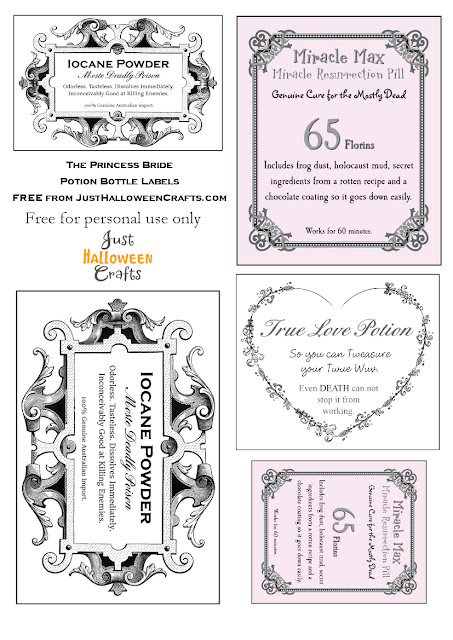 I've never seen any free Princess Bride potion bottle labels before and I wanted some for my Halloween apothecary cabinet display. So I made up 3 fun and free printable designs which I'm sharing with you today. The potion bottle labels are all based on things from The Princess Bride book by William Goldman and the movie. These are perfect for geeks like me who just adore this comic fantasy tale so much. We've got Iocane Powder which is that deadly toxin, Miracle Max's Miracle Resurrection Pill and a True Love Potion all on one printable sheet. If you love The Princess Bride half as much as I do, you'll be wanting these to add a bit of this cult classic into your Halloween decor. Enjoy my free Princess Bride potion bottle labels which you can print out yourself and use to make your own really cool Halloween displays and unique curiosity cabinets. Any fan of the book or movie should love these unique geek style bottle labels. Free printables are near the end of this page. Iocane powder is really rather inconceivably good at dispatching enemies. This is the number one poison you need on your shelf for Halloween! Iocane powder is used in The Battle of Wits scene between the Dread Pirate Roberts and Vizzini. It's one of the deadliest toxins known to man because it is odorless, tasteless and it dissolves immediately. You could say that it is inconceivably good at getting rid of your enemies. At least it would be, if it was actually real. Learn more on Iocane Powder here. The really rather good Iocane Powder potion bottle label. Use this Moste Deadly Poison for your Halloween display and impress all your enemies. These labels work well stuck on to jars and bottles painted in black. The label was stuck first on to some gold textured paper before adding some flat back Swarovski rhinestone gems in a gold tone. A simple black satin ribbon bow with gold dots completes the look. Will the resurrection pill work? It would take a miracle! This pill is simply huge and needs a large box to accommodate it. Miracle Max has the unenviable task of bringing Westley back from being mostly dead. He comes up with an unusual cure with a pill which is the size of a golf ball. Because it is so large, the Miracle Resurrection Pill is all coated in some chocolate to help it slip down the throat a little easier. There's only one catch; it is supposed to work for only 60 minutes. So don't waste any time in using this on your Princess Bride hero. Death cannot stop true love. All it can do is delay it for a while. The True Love Potion is one to be tweasured, always. The greatest love of all is the romance between Westley and Princess Buttercup. Even death cannot get in the way of true love. So this one is clearly the most powerful potion going. If you truly tweasure your twue wuv, make sure that you print this one out and display it well along with the rest of your Halloween props. The True Love Potion label deserves a special looking bottle to stick it on. Choose wisely to honor your own Westley or Buttercup - as you wish. Dotted around the heart shape label are some dark pink color heart beads and some flat back pink rhinestone gems. The bottom of the label has pale pink ribbon bow detail and hanging beads are tied around the neck of this potion bottle. Click on the image to open up the full size which is best for printing and choose "Save As" or "Save Image As" to download it. This free printable is for your personal use only. You are welcome to blog about how you've used this freebie along with your own photos providing that you include a link back to this page.